The Monk James, Bishop of Niziba, was the son of prince Gefal' (Armenia) and received a fine upbringing. From the time of his youth he loved solitude, and for a long time he lived in the mountains around about the city of Niziba (on the border of the Persian and Roman empires), where he carried out strict ascetic exploits: he lived under the open sky, fed himself with tree fruits and greens, and dressed himself in goat-skins. The monk passed all this time in prayerful conversations with God. During a persecution by the emperor Maximian (305-311) he was glorified by a courageous confession of faith. Because of his strict and pious life the inhabitants of Niziba chose him as their bishop (not later than the year 314). Saint James was glorified by his ardent zeal for the Orthodox faith, by great miracles and by the gift of perspicacity. By his prayers Niziba was saved from an invasion by Sapor, the emperor of Persia. Saint James, amongst the fathers of the I OEcumenical Council, was one of the prominent defenders of the Orthodox faith. A wise and educated pastor, he constructed at Niziba a public school, in which he himself was an instructor. He made a strong impression on the hearts of his listeners by the high morality of his life. 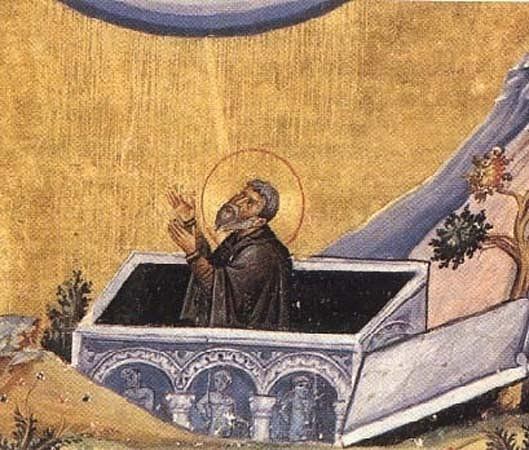 Sainted Gregory, bishop of great Armenia, turned to him with a request to write about the faith, and the Nizibite pastor sent to him by way of reply a detailed Discourse (18 Chapters): about the faith, about love, fasting, prayer, spiritual warfare, the resurrection of the dead, the duties of pastors, about circumcision against the Jews, about the choice of foods, about Christ as the Son of God, and so on. His composition distinguishes itself by its persuasive clear exposition and warmth.